As it turns out, the previous generation Mercedes-AMG E63 has immense tuning potential, and in the right hands – Posaidon in this case, it can become a force to be reckoned with. So what can you do to a car that is still very fast, even by today’s standards? How about giving it 920PS (907hp) and 1,350Nm (996lb-ft) of torque, which is 335PS (330hp) 550Nm (406lb-ft) more than stock. But don’t go anywhere just yet, because Posaidon have an even more impressive performance mod up their sleeve, one that increases the engine’s capacity from 5.5 to 6.5 liters, and tunes almost all components to the max. The result is 1,000PS (986hp) and 1,500Nm (1,106lb-ft) of torque, and this option comes with new limited slip differential and a strengthened 7-speed dual-clutch gearbox to withstand the new power. The Mercedes-AMG E63 S W212 shown here retains the 5.5-liter bi-turbo V8 engine (920 PS), and features a few subtle carbon fiber-made updates on the outside, in addition to the urban camo wrap, and special badges. It also gets the tuner’s sport suspension to round up the changes, whereas the rims, carbon fiber brakes, and interior remain untouched. 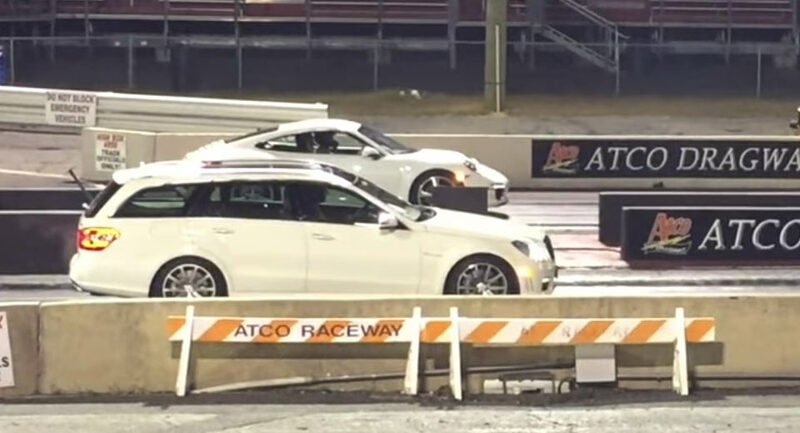 The new Mercedes-AMG E63 S has already proved its mind-blowing performance by going against some very fast machines on the drag strip, thanks to its staggering output of 612PS (604hp) and 850Nm (627lb-ft) of torque that’s good enough for a 0-100km/h (62mph) sprint in just 3.5sec. That kind of performance has rightfully granted the range-topping E-Class the super saloon title. Heck, it’s so fast that the Estate version has become the fastest station wagon to lap the Nurburgring, with a time of 7 minutes and 45:19 seconds and reaching speeds of up to 270km/h (168mph). The following video takes us not on the ‘Ring but the Autobahn for a very fast drive. After a few attempts, the E63 S eventually passed the 300 km/h mark, hitting 307km/h (191mph). 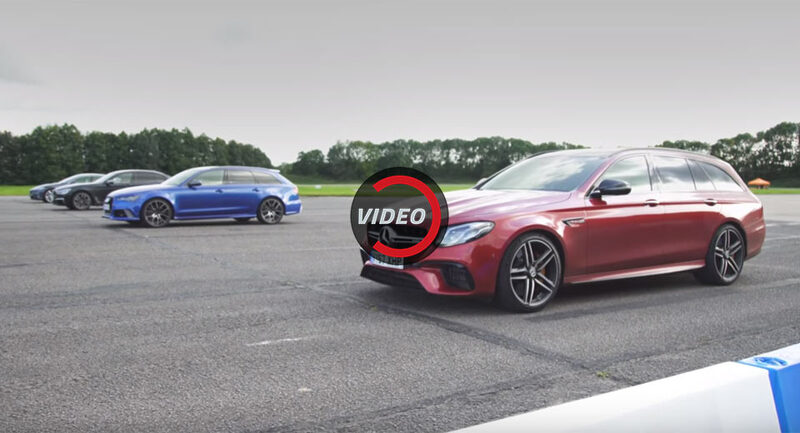 Now, we’re awaiting to see who’ll come up first with the Mercedes-AMG E63 S pinned against the all-new BMW M5, its natural rival and the new challenger to the throne. The stock Mercedes-AMG E63 S is pretty impressive as it stands, with 604hp and 627lb-ft (850Nm) of torque, and a 0-60mph (96km/h) sprint made in just 3.3sec. However, Renntech have improved this super saloon by applying their performance software, which the tuner claims unleashes the true potential of the car. By modifying the throttle mapping, boost mapping, and ignition timing, optimizing air-to-fuel ratios, and increasing the rev limiter, the tuner has made the engine deliver an impressive 773hp and 778lb-ft (1,055Nm) of torque at the crank, and 665hp and 669lb-ft (907Nm) at the wheels. Renntech’s tuned E63 S can now reach 60mph (96km/h) from a standstill just 2.79sec , which makes it 0.11sec faster than the new Porsche 911 GT2 RS. The 0-100mph (0-160km/h) sprint takes 6.61sec, and the quarter mile run is completed in 10.88sec, at 129mph (208km/h). Despite choosing not to release an extensive image gallery of their latest product, Renntech have dropped a short video that shows just how fast their Merc’ AMG E63 S really is. 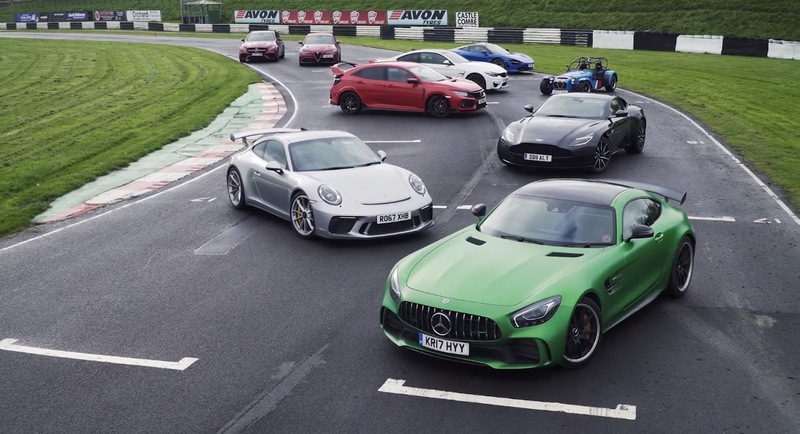 With the Mercedes-AMG E63S repeatedly impressing everyone with its sheer acceleration force, it was always a matter of time before someone would pit it against a Tesla Model S.
UK’s Top Gear magazine has a love affair with drag races and they just had to see if the latest weapon from AMG has any chance of wiping that smug smile off the Model S’s face. The latest E63 S features a special all-wheel drive system which clearly has made it a true monster when taking off from a stop. Its twin-turbo 4.0-liter V8 sends 604hp and 627lb-ft of torque to all four wheels via a nine-speed Speedshift MCT gearbox, propelling the E63 S to 62mph in just 3.4 seconds. The Tesla Model S P100D on the other hand has two electric motors for a total of 680hp and a 0-62mph in a mind-boggling 2.7 seconds. Stupid amounts of power combined with all-wheel drive equals good drag racing, so let’s find out which one is faster. 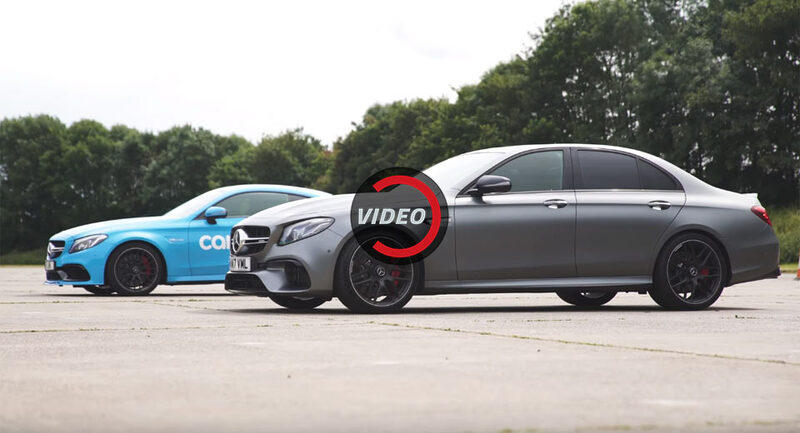 It’s David versus Goliath in CarWow’s latest video, which puts together two very different cars against each other: the estate versions of the Mercedes-AMG E63 S and Dacia Logan. In Britain, the former can be had from around £90,000 and the latter in MCV (wagon) from close to £9,000, while the tested cars here are priced at about £110,000 or the equivalent of $148,000 for the Mercedes and £11,000 or $14,800 for the Dacia. You might say that the two estates have absolutely nothing in common, apart from their five-door body styles and the same number of wheels, as the differences can be overwhelming, which should put this review in our ‘Science Fiction’ category, if only we had one. Still, for the sake of the very unusual video, which won’t surprise anyone, let’s see what Mat Watson tried to do. First, the Dacia Logan and Mercedes-AMG E63 S were unleashed on the drag strip a few times, although that’s a very enthusiastic word to use for the Romanian budget car, which has only 90PS (89hp) from a 1.5-liter dCi diesel engine, whereas its German counterpart makes do with 612PS (604hp). Next came a brake test, from 70mph (113km/h), which was won, again, by the super estate, and finally, the latter proved to be more comfortable as well, thanks to its air suspension. So, what’s the purpose of this video? Well, apparently, trying to find out whether the 10x price difference between the two is that obvious, and we’ll only tell you this: the Merc’ is at least 10x better, if you ever had your doubts. In order for the old AMG-powered E63 S to contend with the brand new model, over 600 horses needed to be injected into the mix. When stock, the old E63 S was good for 585 PS (577 HP) and 800 Nm (590 lb-ft) of torque, leading it from 0 to 100 km/h (62 mph) in 3.6 seconds, or 3.7 seconds for the Estate, which is relevant in our case. The 2018 E63 S on the other hand packs 612 PS (604 HP) and 850 Nm (627 lb-ft) of torque straight from the factory, enough to hit the 100 km/h (62 mph) mark in just 3.3 seconds. We already knew the newer car was quicker in a straight line, both on paper as well as in a real life test. 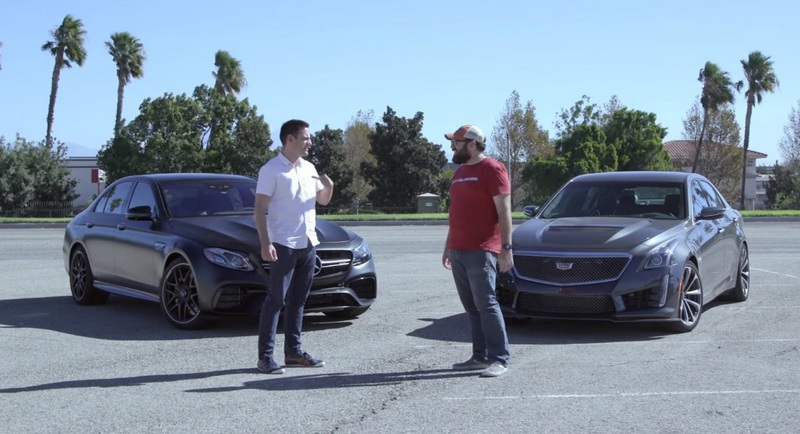 Although, if you wondered how the two would compare if the old E63 S came with a bit more power, you’ll find that this video provides an answer. The car in question (an E63 S Estate) is said to put down over 600 horses, which should at least give it a better chance of keeping up. Also, the two AMGs raced from a rolling start, which simplified matters since neither had to worry about losing traction. For something that has four doors, enough room in the back for two or three adults plus a spacious boot, keeping up with a Nissan GT-R, let alone beating it over a 1/4 mile, can be considered a solid achievement.